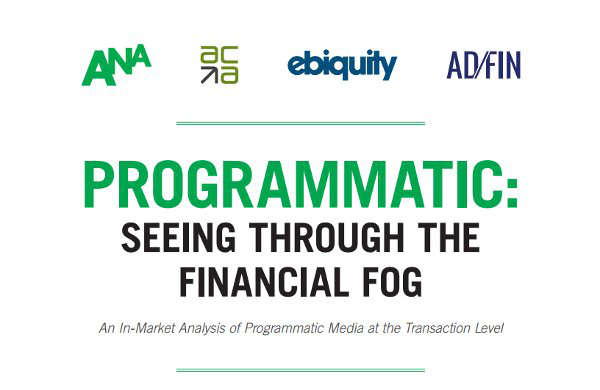 I’ve just read the latest ANA report, ‘Programmatic: Seeing through the Financial Fog’. It may be big enough, but is it broad enough? All analysed impressions were part of fully disclosed programmatic buys – non-disclosed buys were, as the report states, not available ‘by definition, as they prevent access to transactional cost and fee details’. ‘The vast majority (over 95%) of analysed data was not executed by an agency trading desk’. The report did not attempt to uncover or measure arbitrage (agencies buying low-cost inventory and selling it on at inflated cost to the advertiser). The report was not able to account for the effects of ad-fraud in calculation of effective cost. There are a number of reasons why this is all a bit challenging. I started struggling to understand what, as a result, this report actually was actually going to deliver of genuine value to advertisers, beyond what is already known. Does the report fundamentally establish new ‘tech tax’ benchmarks? It’s difficult to say that the findings of this report are conclusive because they focus only on disclosed agreements, and do not account for inventory arbitrage. Despite various reports of ‘’the impending death’’ or evolution away from non-disclosed trading models, a large amount of programmatic activity is still conducted on a non-disclosed basis, in one way or another. And there seems to be a significant degree of advertiser confusion. 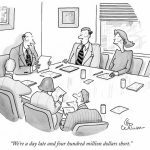 A World Federation of Advertising (WFA) survey published at the start of 2017 suggested that 70% of respondents used an Agency Trading Desk model, which are, in my opinion, likely to be at least partially non-disclosed. However, just over half (53 percent) of those surveyed said they have a “disclosed or transparent” relationship with their programmatic provider, while 33 percent said it was “non-disclosed or non-transparent.” Which leaves the remaining 14% uncertain. In fairness, the WFA survey also claims that significant numbers of advertisers now want more transparent arrangements. But in reality, are these arrangements actually coming into force? I’m not sure. But it’s worth noting that only 12% of seriously interested advertisers were actually able to participate in the ANA assessment (more on this later). The rest were blocked from doing so by contractual or other obstacles. Which to me is a clear indicator that most still operate a non-disclosed model. Unsurprisingly, the top-line findings of the new ANA report suggested that the ‘tech-tax’ imposed on advertisers was less than the 60% found by the WFA in 2014. Yet this is clearly unconvincing given the breadth of what the study was able to report back on – indeed, the report repeatedly states its own limitations. So no – the benchmarks in the report can’t really be considered as fundamentally established. In fact, given what this study tells us without the inclusion of non-disclosed agreements, I’d probably revert to the numbers produced by the ANA in 2014 as more accurate. Does the report deliver useful media cost benchmarks? The report is interesting in that it demonstrates average CPM costs across display and video formats. But again, it self-states the limitation of the findings – namely that, just like any media buy, there are multiple variables in trading strategy or campaign objectives that could significantly alter the end CPM. In addition to which, of course, CPM is not the only method of cost-measurement in the world. So again – interesting, but not hugely useful. Does the report tell us anything new about non-transparent practices? Advertisers should demand and negotiate greater levels of transparency from agencies in the programmatic space. Agency trading desks are generally not transparent operations. There’s a lack of understanding amongst advertisers regarding programmatic trading. Financial transparency is important, although this in itself doesn’t guarantee performance – there needs to be clear KPIs established. Great learnings – but to be honest, there’s nothing in here that hasn’t already been said in one form or another in the previously released reports. The learnings are used as a base for the final stage of the report, a ‘Playbook’ for advertisers, advising them to seek proper guidance, establish proper parameters, set up proper systems, consider the trading options…sound familiar? That’s because…well, it is familiar, not just from previous ANA reports, but from many other sources. So does the report tell us anything of value? This piece of work tells me one thing that isn’t explicitly stated, but is suggested in many different ways. Agency holding groups, rightly or wrongly, continue to largely ignore, deflect or work around repeated industry calls to become more transparent. And so far, this has been a largely successful strategy. Consider this. The report states that the assessment team approached 100 major US and Canadian advertisers. From this group, 58 expressed serious interest. 88% of these 58 advertisers were forced to drop out due ‘in many cases’ to having signed non-disclosed, or otherwise non-transparent agreements with their agencies that didn’t allow them to participate. They didn’t have any right to audit, or in some cases even access, their own data. Or – perhaps more worryingly – they’d been talked out of it by their agency, regardless of what their contract said. One of the many ‘Obstacles to Transparency’ stated in the report is ‘discouragement from agency partners’ – in other words, agencies simply digging in their heels and telling their own clients that participating would be a ‘resource drain’ and that ‘the study would provide no tangible value’. Ultimately, only seven of the 58 – 12% – were able to fully participate. And this in a study that purposely avoided taking on ad-fraud, non-disclosed agreements or arbitrage! At the end of the day, despite everything, the agencies, at holding group level, still hold the balance of power. They’ve been staring the industry down for the last two years now, whilst simultaneously proclaiming variations of ‘complete transparency’. The options have evolved; ‘disclosed’ models are now available. But then again, I’ve seen more than one contract template issued to my own clients in the last 12 months from large networks, which doesn’t mention data ownership, audit rights, principal-based buying, or anything else. In other words, contracts that provide the advertiser with no rights and no protection in this area. Contracts that have not evolved in ten or fifteen years. Contracts that are being issued in 2017 at time of agreement or renewal of agreement. No wonder only 12% of advertisers ended up participating. Frankly, I’m surprised it’s that high. 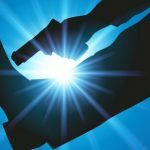 Whatever the rhetoric or the newer options available, the agency networks are probably more likely to try and default to a non-disclosed agreement, wherever possible. The ANA should still be respected for its efforts. Please don’t misunderstand my intention in this post. I am not trying to denigrate the efforts of the ANA and its partners. They are clearly experts. Much of what I see in the report are obstacles that we come up against in work with individual clients. And I don’t claim to have new answers myself; there’s no cookie-cutter here. The only constant, to me, is that every individual client/agency situation is nuanced in different ways. As I say in the title, the intent is laudable, and the effort and rigour is clearly considerable. But, with all that effort and all the big numbers, the sad thing is that the surface is still barely more than scratched. Whilst the advice is solid and well-articulated, it simply doesn’t represent a step-change from previous reports. As long as the holding groups continue to stare the industry down, and their clients, for whatever reason, accept the status quo, not much – in day to day reality – is going to change.